Quipped attempts to describe Illinois Ornithological Society‘s Saturday’s 16th Annual Gull Frolic were “Duck Frolic” and perhaps “Herring Gull Frolic.” To paraphrase the observation of Amar Ayyash, our local gull expert extraordinaire who organizes the event, when the weather is good for people, it’s bad for gulls. In other words, there wasn’t enough ice on the lake to draw the gulls in to the shore. We can be fairly positive the rarities were somewhere out in the middle of Lake Michigan, if not totally on the other side of it. Even with only a few species present, I have to review and refresh my sparse knowledge of gulls again because often this is my only chance to see anything other than a Herring or a Ring-Billed. So disinterested were the birds in us, at one point there was more bread floating around in the water than gulls. The first bird I photographed was a male Common Goldeneye, below. And as for other ducks, there were a few here and there, although none too close. 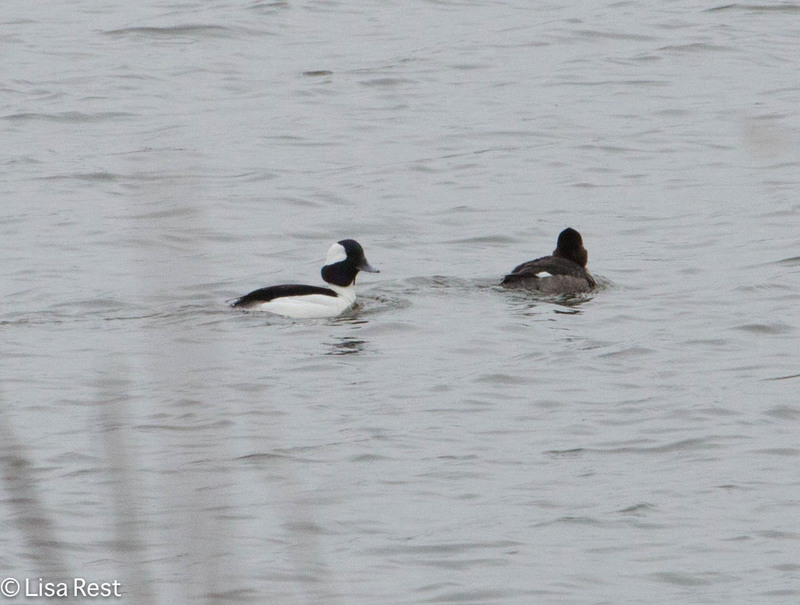 Above, a female Bufflehead on the left and more Bufflehead and a Greater Scaup on the right. 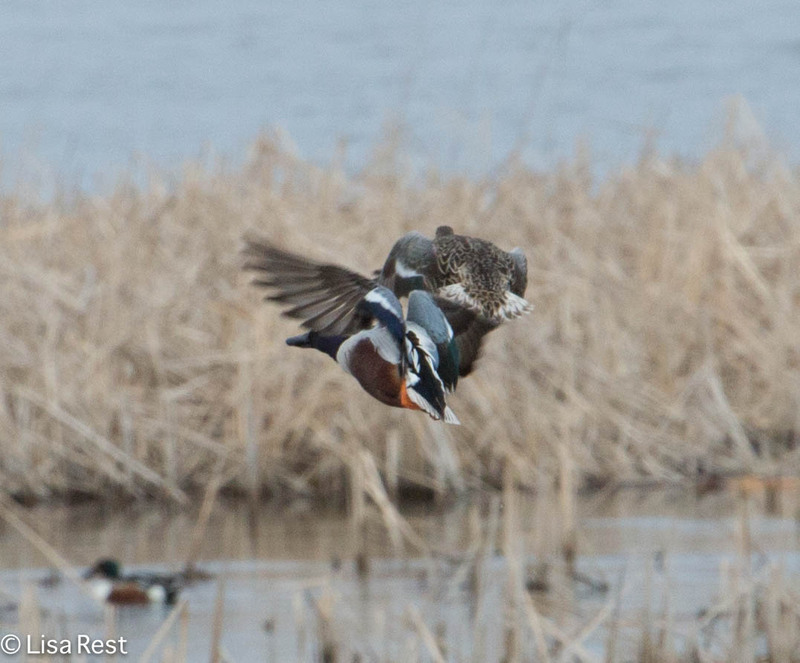 Below, Mallard and Bufflehead flying. 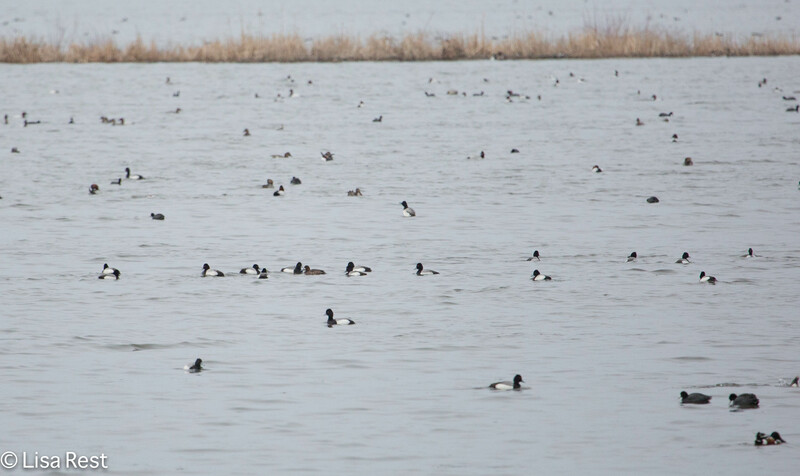 The Common Mergansers were perhaps the most numerous. Two shots of a close female below and more flying. Other waterfowl present but not photographed were American Coots, a few Long-Tailed Ducks I did not see, and a very distant group of White-Winged Scoters. Gulls were quick to seize the opportunity to stand on whatever little ice there was. Among the Herring Gulls below there is one Thayer’s, if you like a challenge. Of the two Thayer’s Gulls spotted, I was fortunate to get a shot of the one below when it finally decided soggy bread was worth bothering with. 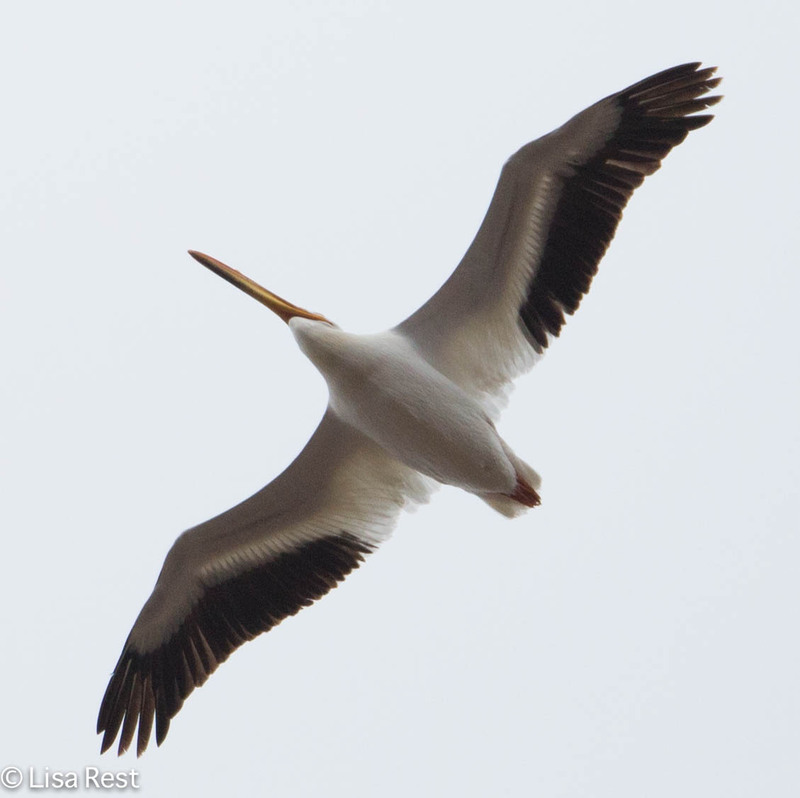 There was a flyover Great Black-Backed Gull I did not see because I was inside attending one of two lectures given by Jean Rice regarding her study of shorebirds in St. James Bay. At some point a Kumlien’s Gull appeared, but I was not seeing it. Maybe the camera saw the Kumlien’s but if I’m not aware of it, I prefer not to go back over all my pictures to find one. 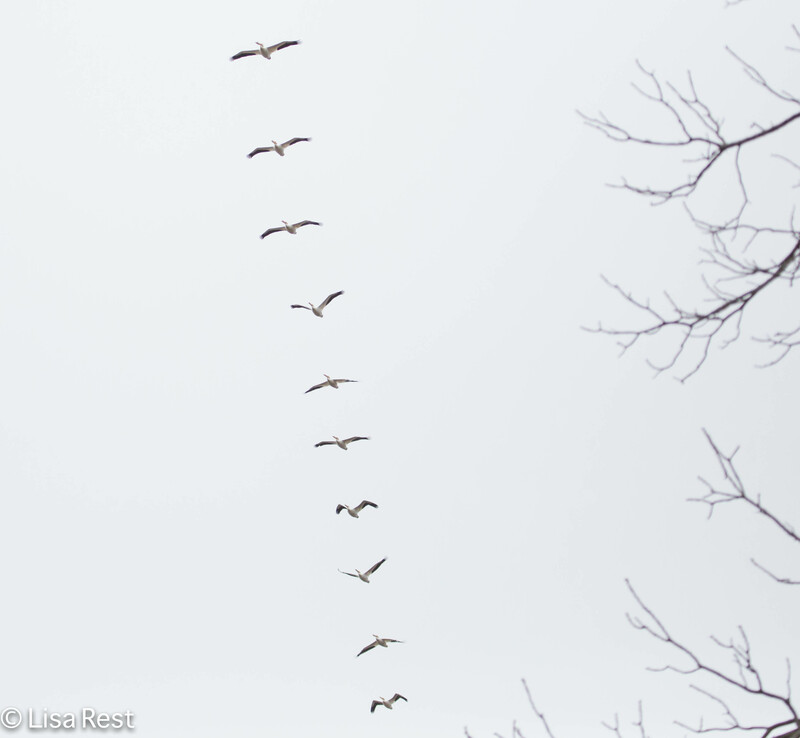 Perhaps an expert can spot this gull in the grouping at the very top of my post, but I suspect there is not enough information in a static shot. Below is one of only a few Ring-Billed Gulls. So I decided to survey the gulls present and make it an exercise in photographing different Herring Gull plumages. The darker they are, the younger. 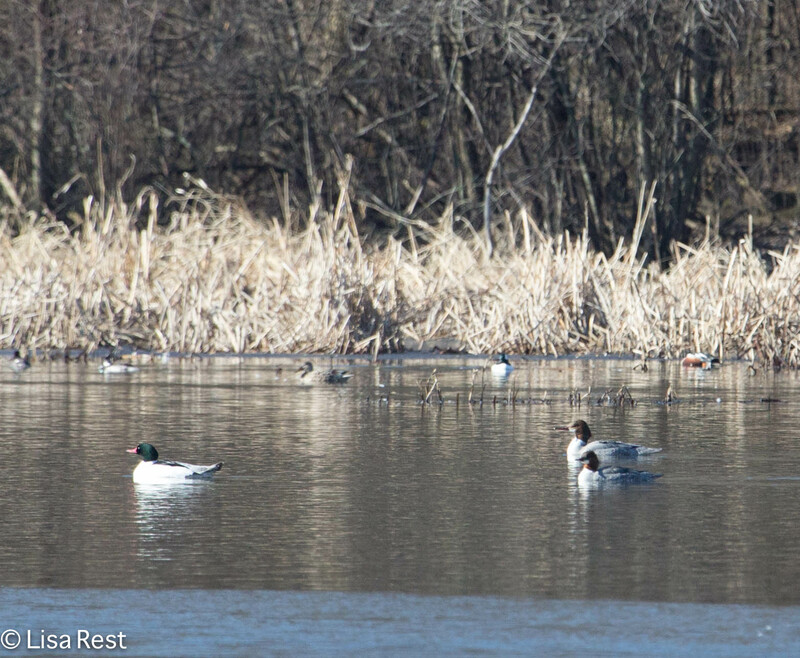 I was happy to see this shot of a female and male Common Merganser in my pictures. 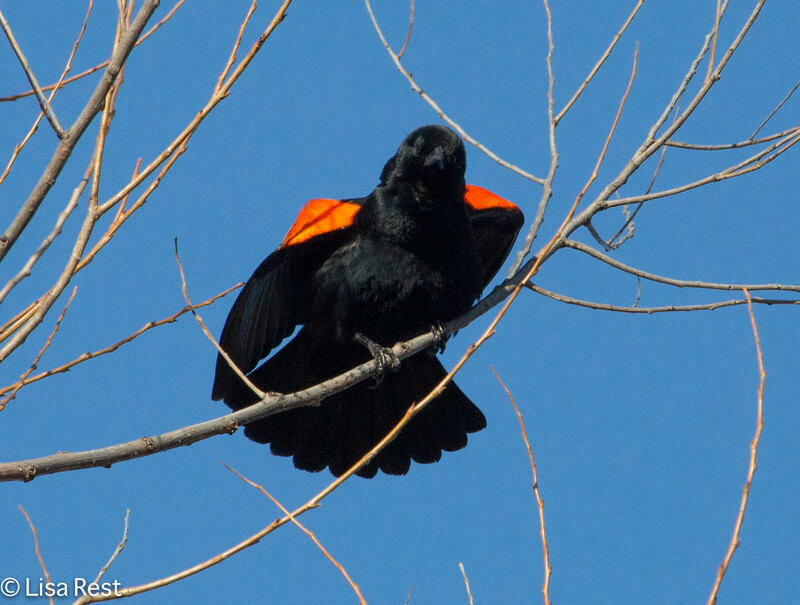 We appear to be continuing with warmer weather, which is neither here nor there as far as birds are concerned, but the wintering avians are starting to think and sound a lot like spring. 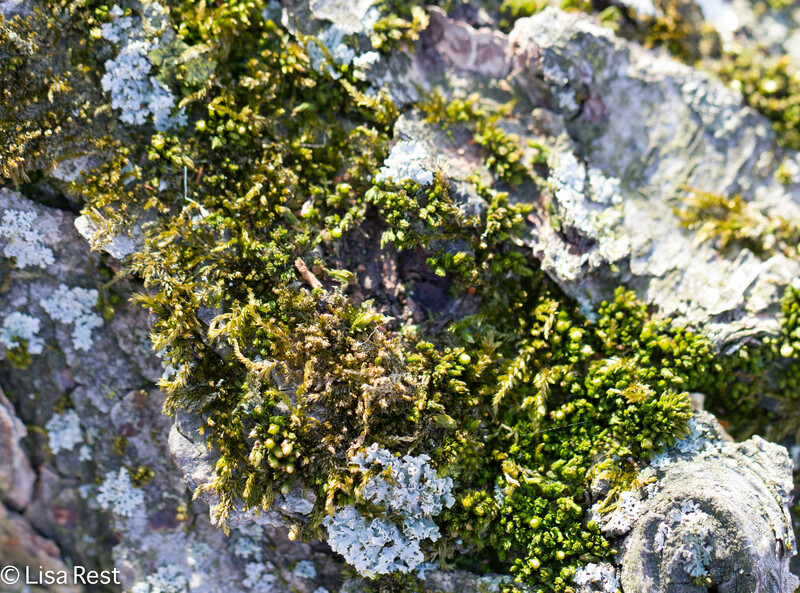 And no matter how bad things seem to get, spring will always feel like renewal. 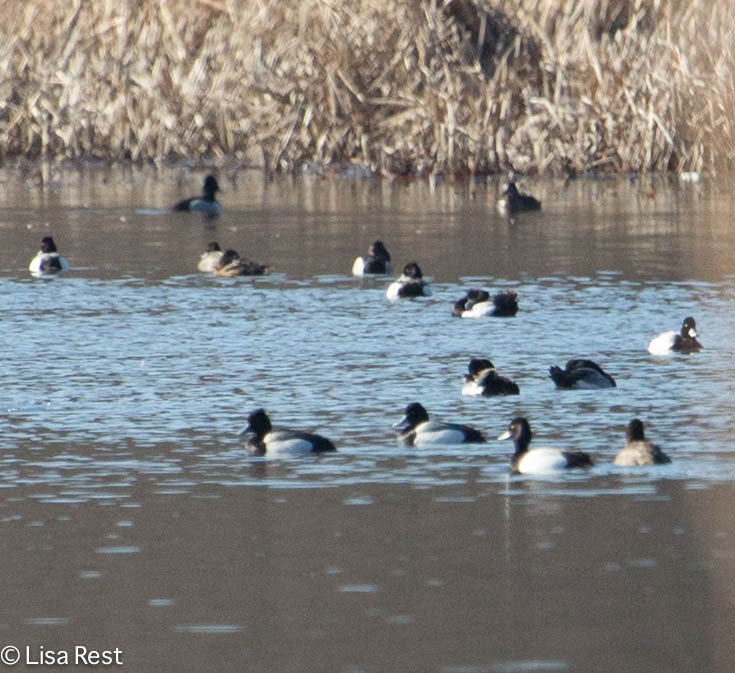 Last Sunday my friend Lesa and I joined Jeff Smith’s DuPage Birding Club outing to the Dixon Waterfowl Refuge at Hennepin-Hopper Lakes in Bureau County, Illinois. The weather was cooler than predicted and cloudy, but it was good to get out. As you can read the link, the refuge is fairly new. Twenty years ago the water was still drained out of it for soybean and corn fields. 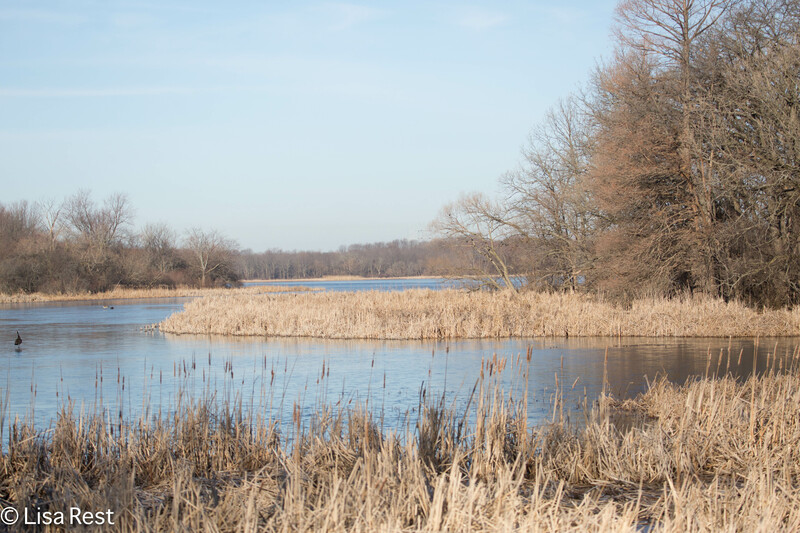 Since restoration, Hennepin-Hopper has attained Audubon Important Bird Area status and in February of 2012 was listed as a wetland of international importance. 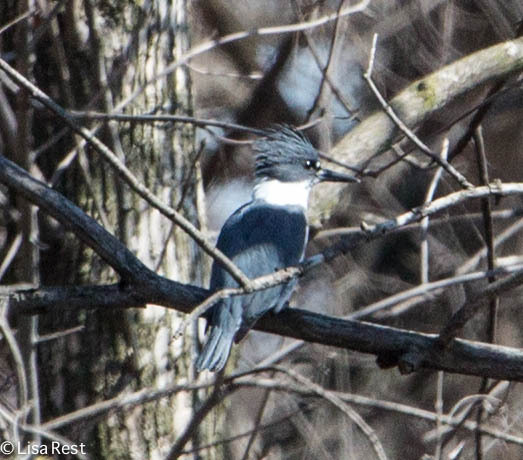 On the map, Hennepin-Hopper inhabits an area to the south and east of the crook in the Illinois River when it changes course from west to south. 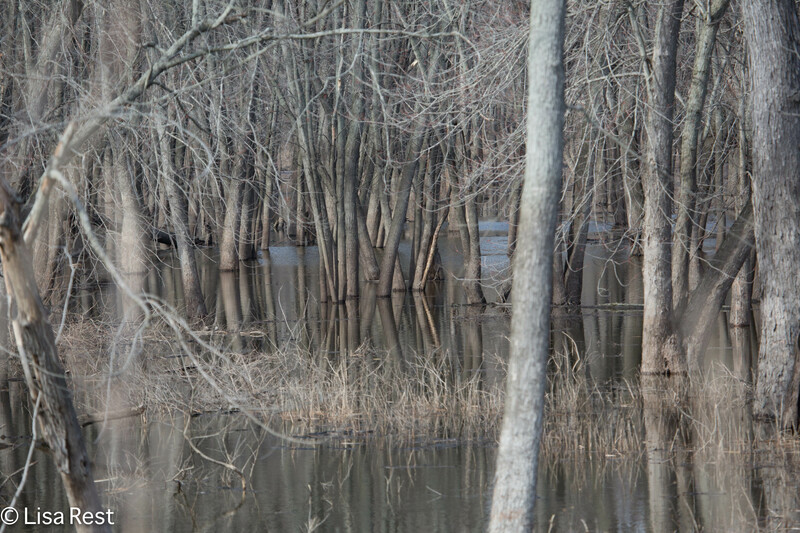 In addition to marshes and lakes, there are a lot of bottomlands close to the river as well. 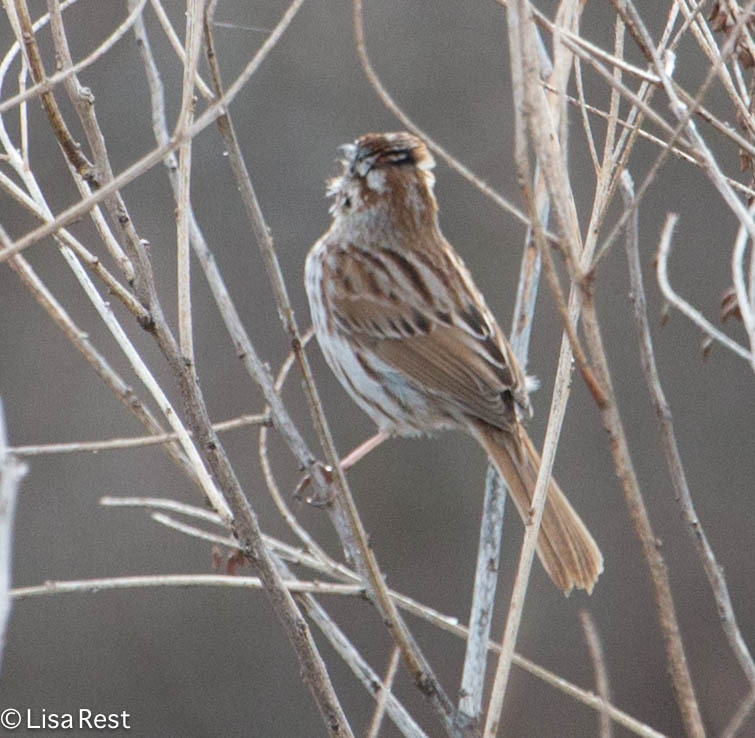 We walked a trail through the marshes that border the lakes, and there we saw and heard plenty of Red-Winged Blackbirds and Song Sparrows proclaiming their territories. 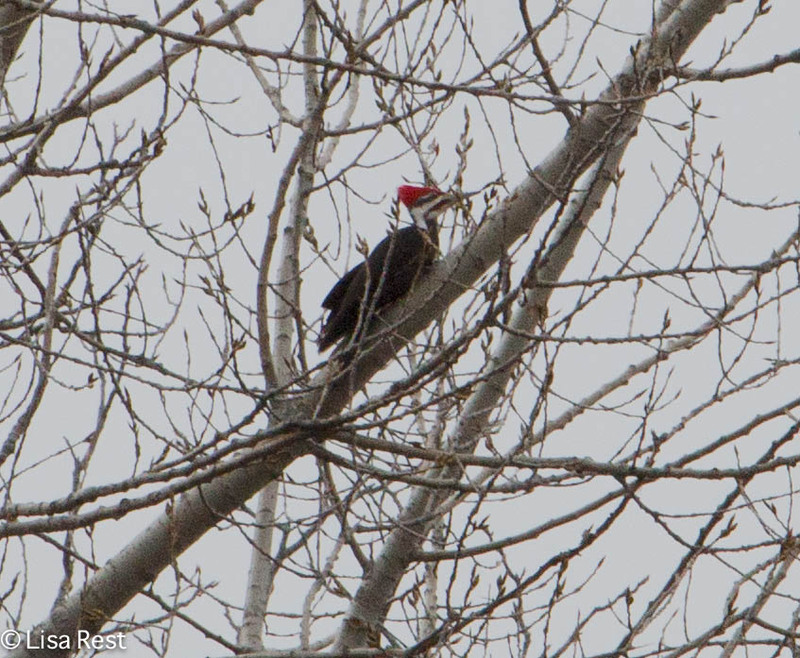 I believe we had all seven woodpecker species: Downy, Hairy, Northern Flicker, Red-Bellied, Red-Headed, Yellow-Bellied Sapsucker and Pileated, which is the rarest of all, but for some reason the Pileated was the only one I got representative pictures of, and it was far away. 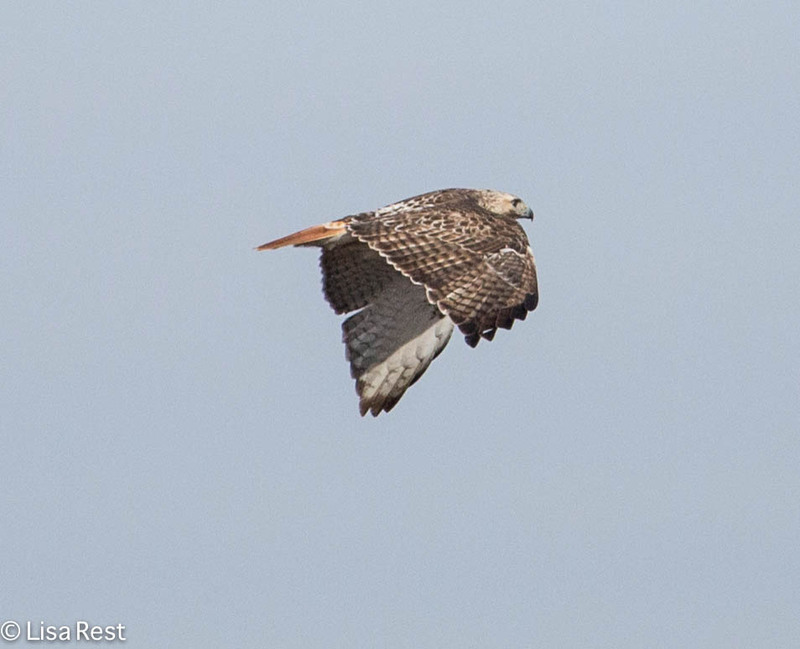 We had a couple Red-Tailed Hawks and Northern Harriers. One Red-Tail was close enough to photograph. Click on the picture to see a larger image. 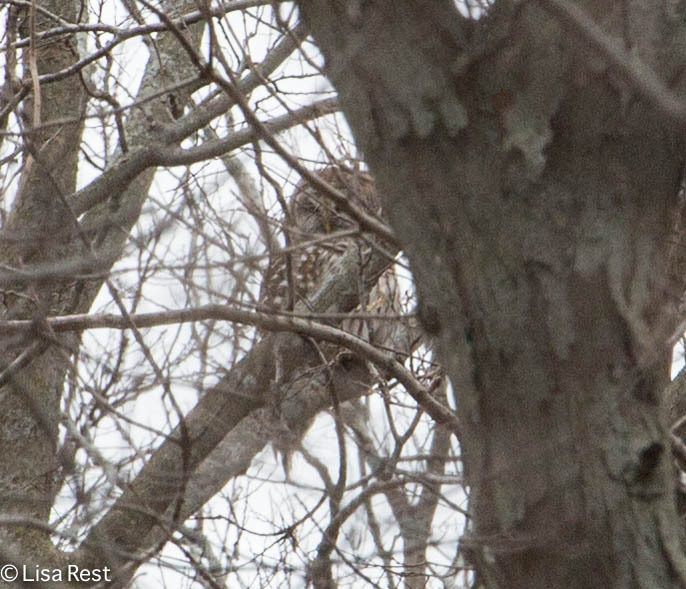 At one point we heard Blue Jays harassing something and it turned out to be a Barred Owl, distant and well-hidden behind several trees. The only thing making this photograph possible, I suppose, is the absence of leaves. 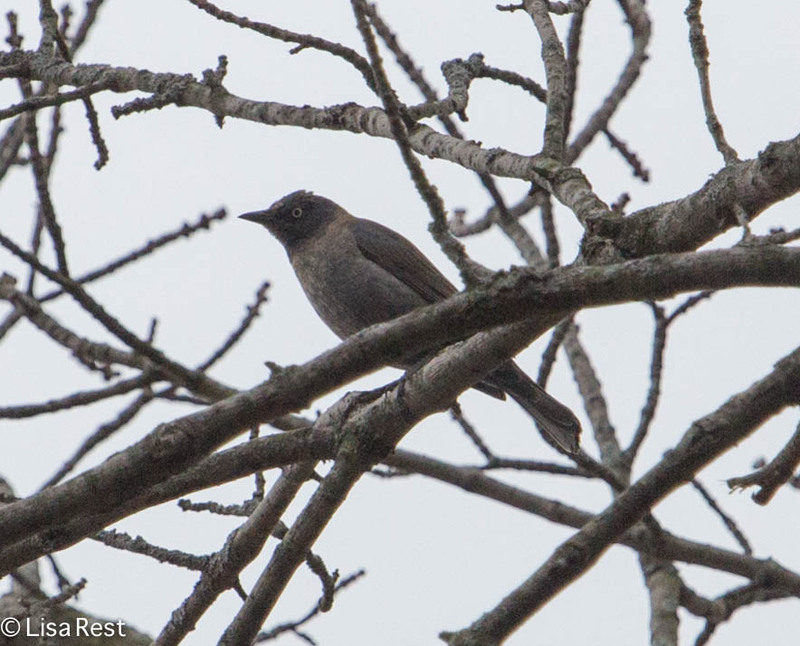 Also a bit rare, Rusty Blackbirds. We’re always on the lookout for them as they pass through. The drab backlighting doesn’t do them justice unfortunately. 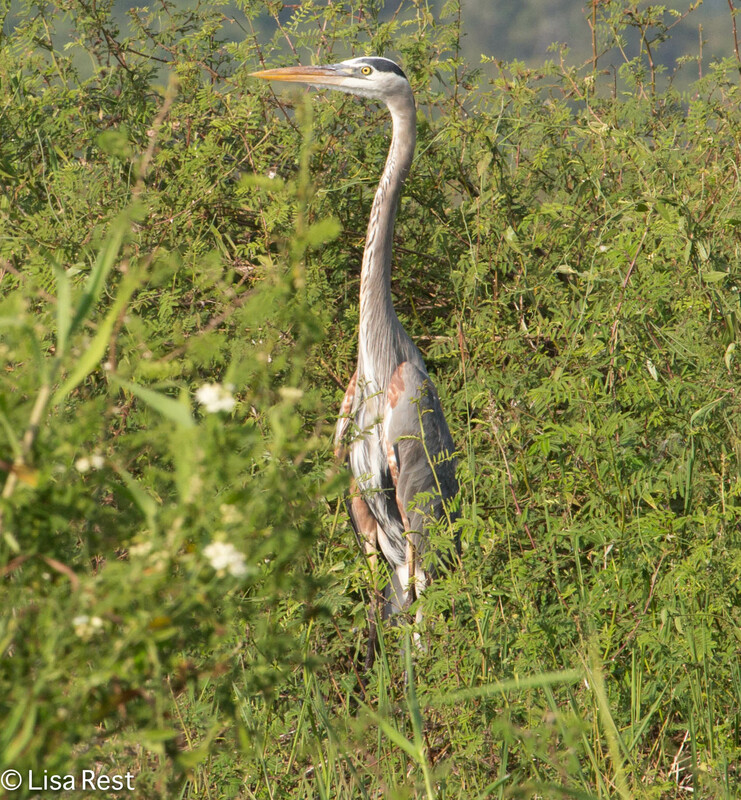 This Great Blue Heron blended in, even in silhouette. So where are the lakes and the waterfowl, you say? 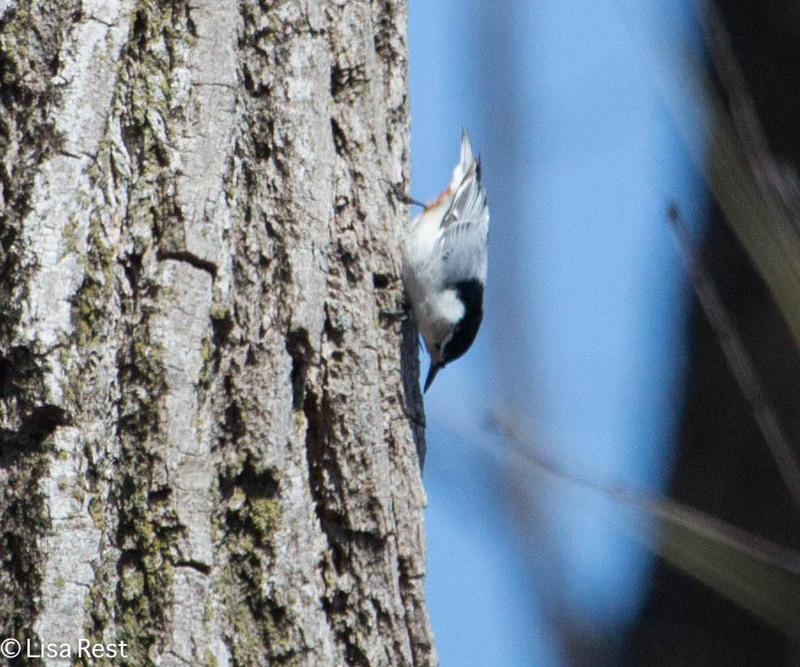 A lot of pictures like the one below, but hardly ever close enough to take pictures of the several species we had. 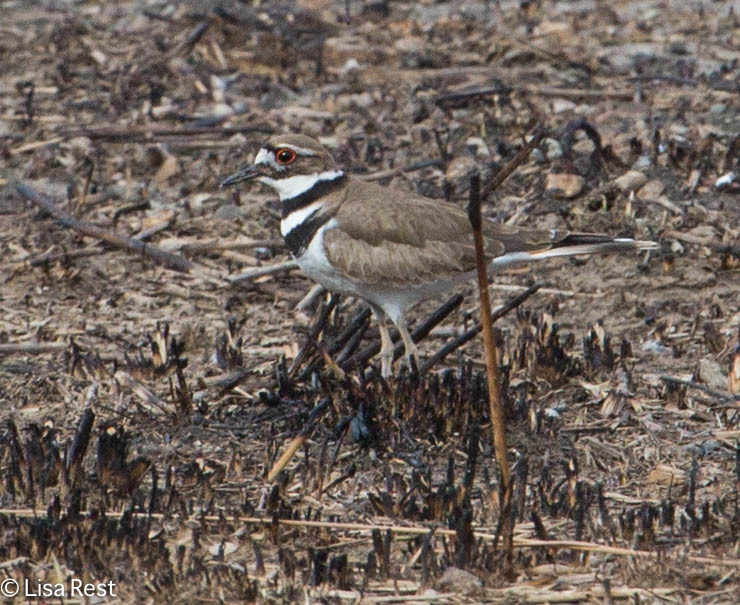 And our only shorebird species was a Killdeer. 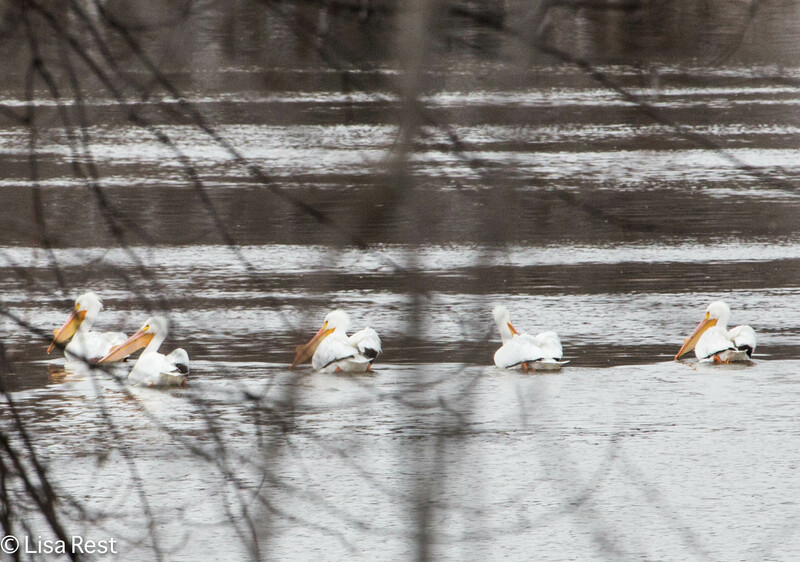 American White Pelicans were a presence. 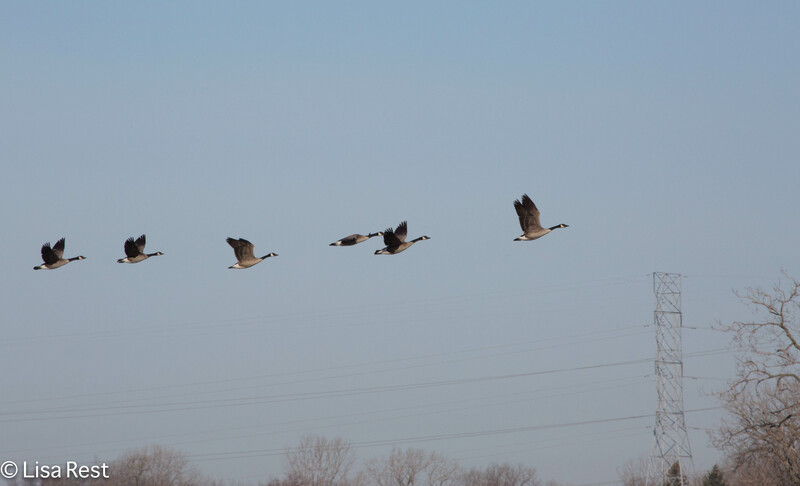 Below, several flew over shortly after we arrived. Later we caught up with them or some others on the Illinois. 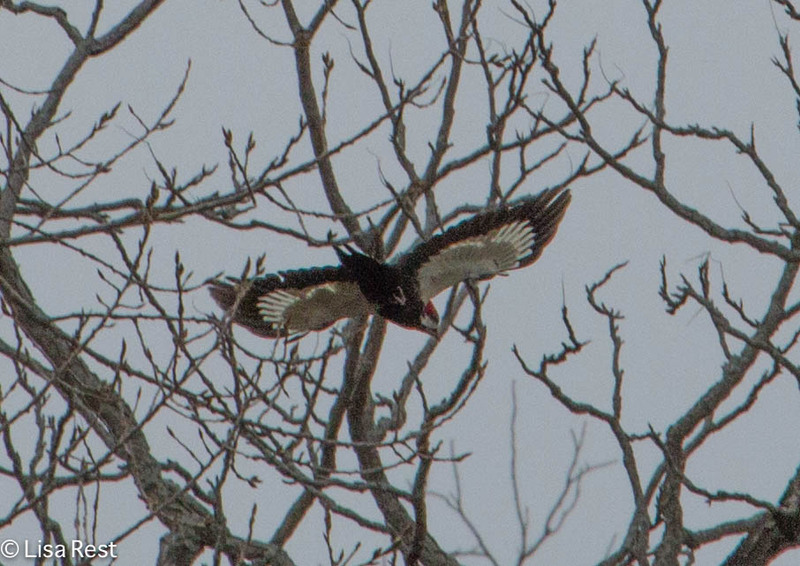 Here’s a closer view of one that flew overhead. 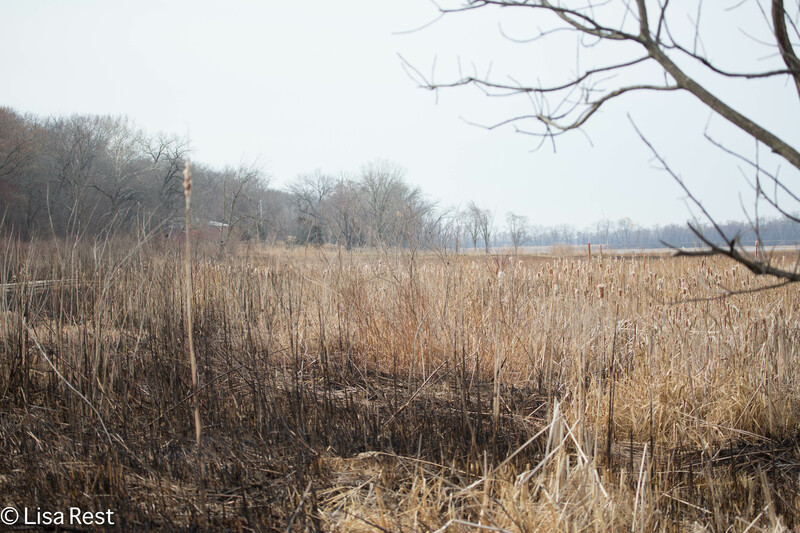 Perhaps the bottomlands left the greatest impression on me. 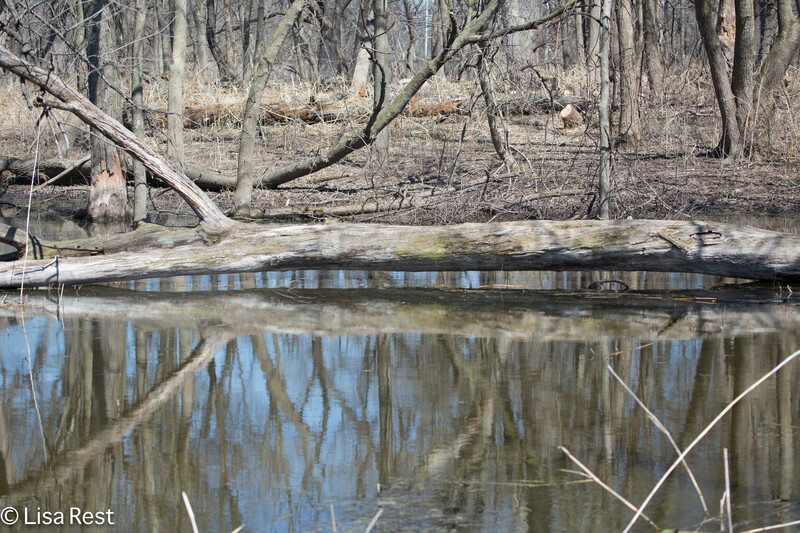 The reflection of the tree trunks in the water is mesmerizing. 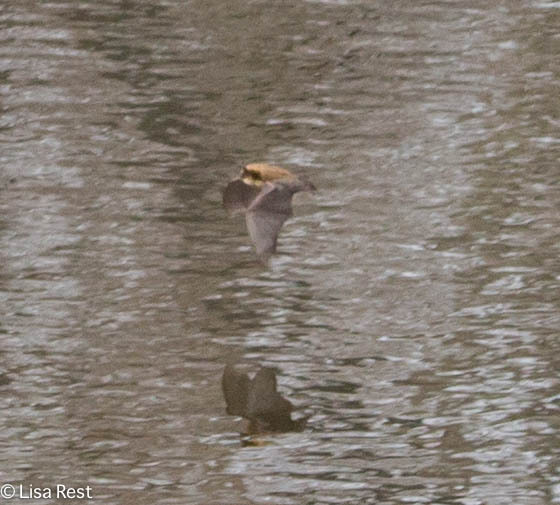 Turning homeward, we stopped by some bottomlands to see Wood Ducks and Mallards, but were eventually distracted by a Little Brown Bat hunting over the water. It’s been a hellishly busy week but I will be back. However deceiving the weather may be, the birds are on schedule. 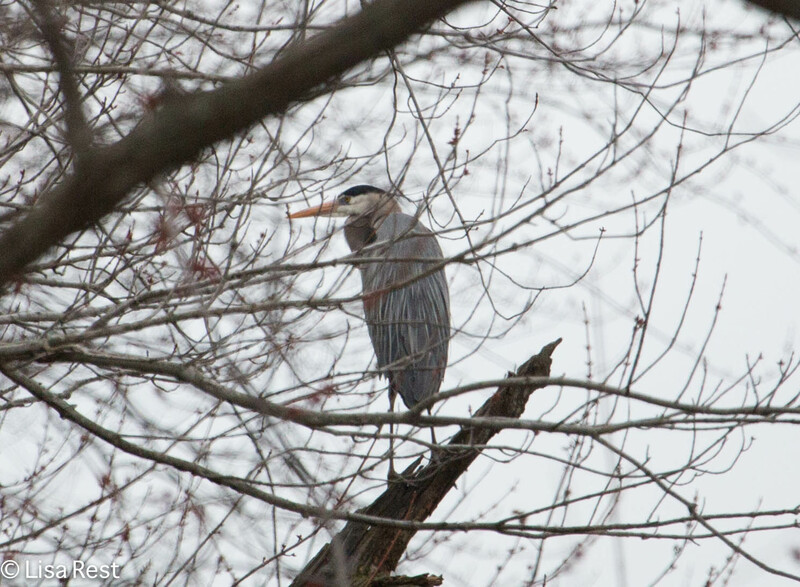 I checked on the Portage and McGinnis Slough last Sunday morning. A grey, chilly day, with a forecast of some snow in the arfternoon. But this lovely singing Carolina Wren was my reward at the Portage. 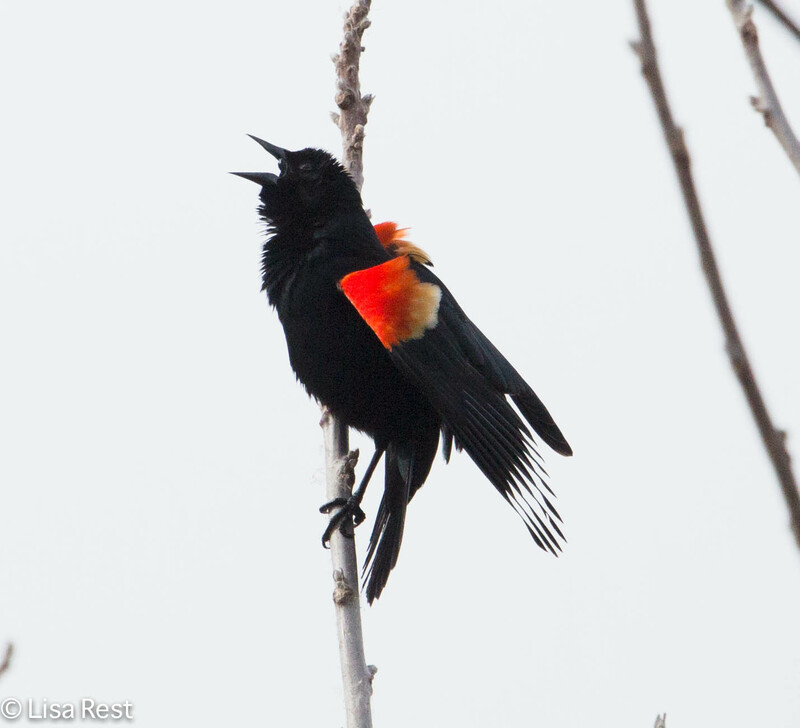 He was a bit too far away to get the clearest image, but he kept on singing. 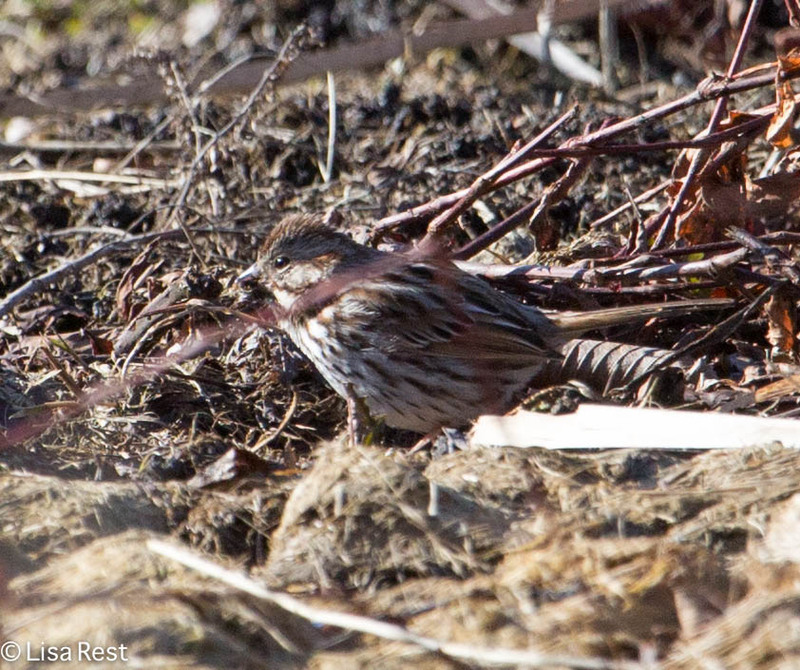 And of course a Song Sparrow announced his presence. And a Canada Goose blowing in the wind. However common Mallards, the males are beautiful this time of year. And an American Robin for good measure. The Portage was just barely waking up. So I went to check McGinnis Slough. 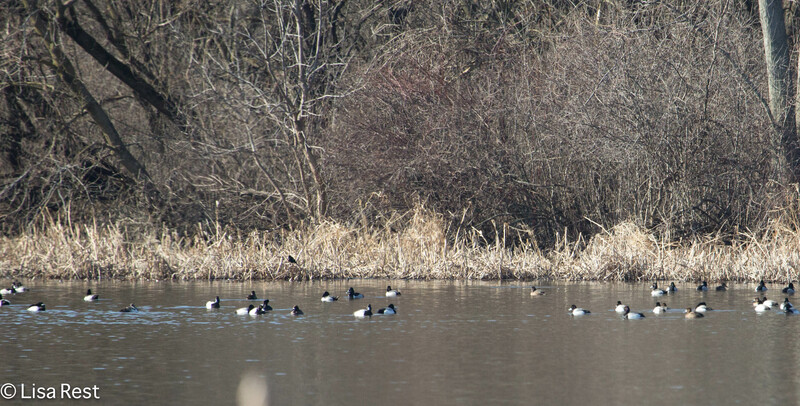 Most of the waterfowl was, as usual, far away, but I managed a picture of this male Bufflehead. 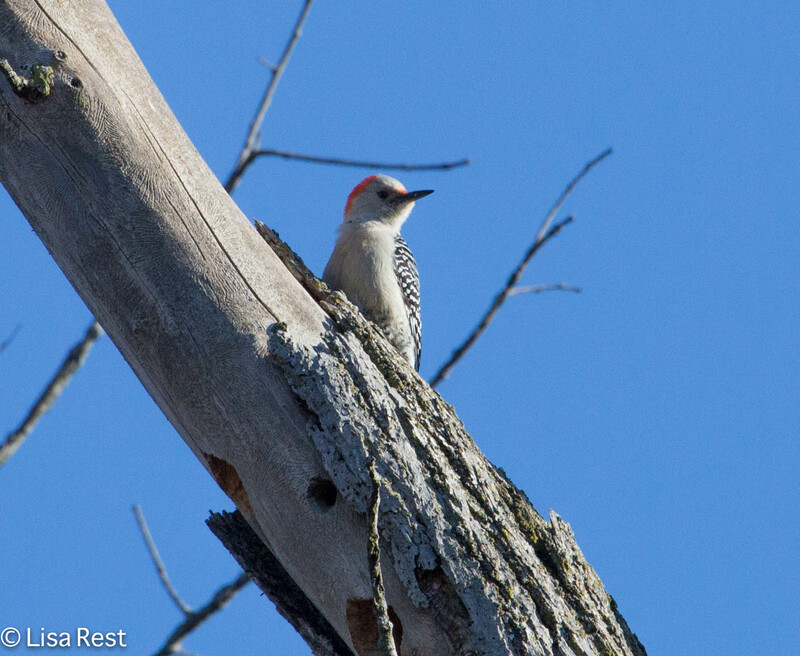 One of two Red-Bellied Woodpeckers checking out this tree stump. 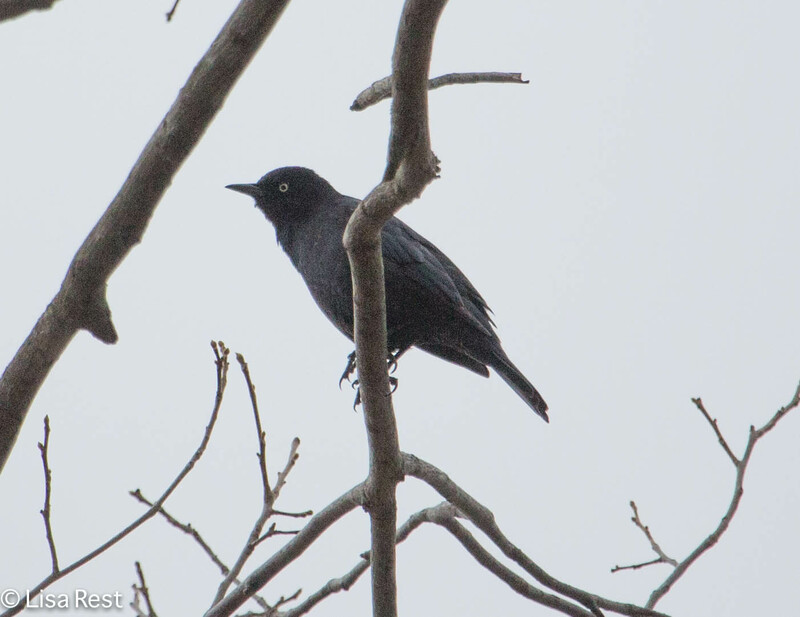 Many Grackles, this one caught in flight. And my first warbler of the year – predictably a Yellow-Rumped Warbler, but still very nice to see.